Ceramic tile is one of the most popular flooring products used in kitchens, bathrooms and other areas where water or spills are expected. It is low-maintenance and durable, and can be expected to last for many years if properly installed. If you currently have linoleum floors in your home, it's important to properly remove this material before installing ceramic tile, as tile needs a stable and solid base so that it won't shift or slip. Fortunately, this project is fairly simple, and can be completed by the average homeowner over the course of a weekend. 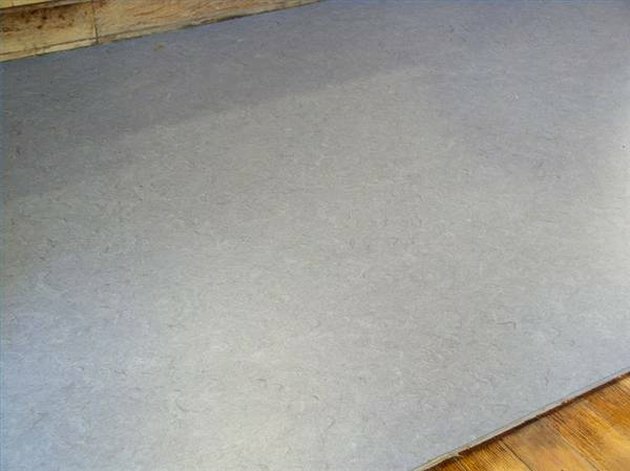 Start in a corner of the room and remove a small piece of the linoleum so that you can see what the subfloor is made of. You may need to use a floor scraper to pry the linoleum up, or it may pull up easily by hand. Most of the time, you will find a plywood base under the floor, though it is possible that the linoleum was installed directly over the concrete subfloor. Use a circular saw to cut through the linoleum and the plywood base underneath. Cut the material into 6 inch wide strips to make them easier to remove, them pry up the entire assembly using a pry bar or your hands. Prepare concrete subfloors by filling any cracks or holes with a patching compound before you begin. If the surface is uneven, consider using a self-leveling concrete mix to level out the floor before proceeding with tile installation. Measure the room to determine how much material you will need. Add 5 percent to the actual square footage to account for damaged tiles or installation/cutting mistakes. Snap a chalk line from the center of each wall. The point where these lines intersect is the center of the room, and is where you should begin laying tile. Starting here, rather than along a wall, helps mask any uneven or crooked walls. Begin laying your tiles starting at the center of the room. Do not use any adhesive at this point, as you are simply determining layout. Cut any tiles as necessary using a saw or tile cutter. These items can be rented from your local home improvement store for the day as needed. Apply tile adhesive to the floor in a small area using your trowel. Apply a bit to the back of each tile as well before setting it into place. Continue with this system, working in small areas at a time, until all the tiles have been installed. Wait 24 hours for the adhesive to set, then mix your grout in a bucket according to the instructions on the package. Properly mixed grout is so thick that it will stick easily to your putty knife without falling off. Add grout between your tiles using your grout floater. As you work, wipe away excess grout from the tiles using a damp sponge. Wait 24 hours, then apply a grout seal, using a paintbrush for best results.